Today, KBC Ireland has published its annual report for 2012. It had previously announced its 2012 results in February 2013, so there isn’t very much that is new but it’s still worth a blogpost. For information, the Belgian KBC group report and accounts for 2012 are available here. We learn that KBC Ireland has a new chairman, the bank’s fifth in five years. The new chairman is Danny de Raymaeker but it’s an exotic name to remember and he mightn’t be around for long, so probably no need for pronunciation tips. There are also two recent Belgian additions to the Irish bank’s board, Bart Guns and Jan Gysels and these two gentlemen are now the chair and deputy chair of the Irish risk committee at the bank. Something tells me the Belgian parent company is getting serious about the problems at the Irish unit. KBC had another bad year in Ireland in 2012 and it lost €350m before tax, compared with €308m before tax in 2011. By the standards of AIB, Bank of Ireland and PTSB, these are small losses. Impairments on loans increased from €525m in 2011 to €547m in 2012. KBC managed to add 22,000 new deposit customers during the year which was no mean feat in the Irish market, and its deposits grew from €1.7bn in 2011 to an impressive €2.7bn in 2012, attracted by comparatively high interest rates. Its loan book shrank from €16bn to €14bn, partly because of the €0.5bn impairment and partly with loan redemptions and practically no new lending. KBC Ireland doesn’t provide Loan-to-Deposit figures but the above implies the bank has a ratio of 523% which is scary though it’s down from 922% in 2011 – KBC Ireland has traditionally been funded by its Belgian parent rather than domestic depositors. KBC in Belgium shoveled €380m into the Irish bank in 2012, and remember this ultimately comes from a bailout by the Belgians – the Irish aren’t the only patsies in Europe. The total bailout to date of the Irish unit is €930m. The €380m injection in 2012 appears to be shown in the abbreviated balance sheet as “other equity investments” and compares with nil on this line description in 2011. 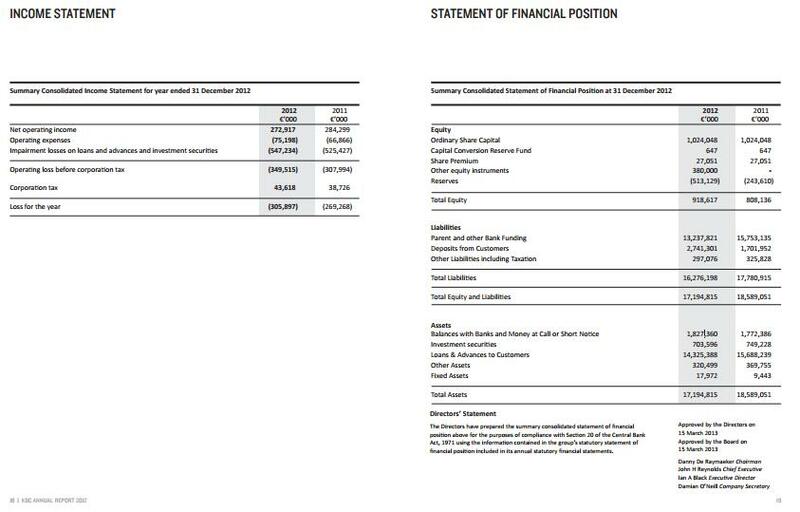 KBC Ireland has equity of €0.9bn versus assets of €17bn. The Central Bank has been asked about this transaction, but we’re unlikely to get a quotable response as the CBI doesn’t comment on the capital position of individual banks. There is no reference to the €380m at all in the parent company’s report. What would happen if the Belgian parent decided to cut its losses in Ireland? What if the Belgian government rushed through a KBC Ireland special liquidation? The deposits under €100,000 would be covered by the Central Bank’s Deposit Guarantee which had €400m on hand at the end of 2012. The Belgian parent has at all times been supportive of the Irish operation and has not indicated it is considering its options, but the latest set of accounts, along with the parachuting of Belgians to the board of management, must give everyone pause for thought. It now seems that either Starwood Capital or Pimco will win the portfolio, paying less than 25c in the euro or less than €200m in total. At least it shows progress and ability to learn at NAMA, though we may be left wondering if we have lost out on millions on Project Aspen because of the approach adopted there. The Central Bank has announced that Matthew Elderfield, the deputy governor of the CBI and the Financial Regulator has resigned his €340,000 a year post at the bank, and will be returning to the UK in six months “to pursue other interests”. Matthew joined the CBI in January 2010, four months after Professor Honohan had been appointed. Governor Honohan pays tribute to him in general terms this morning. Though more efficient and competent than his predecessors, the view of him on here was never great and circulating glowering photos was not a substitute for the serious remedial work needed in Ireland’s banking sector. Matthew’s stress testing of the banks in 2010 were comical, and it was not until 2011 when an independent stress testing by BlackRock, Barclays Capital and Boston Consulting was carried out under the auspices of the bailout Troika that the markets had any real confidence in what lurked beneath the balance sheets of Ireland’s covered banks. Whilst Matthew did champion new rules to ensure senior roles at Irish banks were occupied by those untainted by the crisis, we still have the gung-ho Richie Boucher at the helm in Bank of Ireland and we have been reminded in recent days how Ritchie supported Sean Dunne and the ultimately disastrous development in Ballsbridge. The statement this morning says “Mr Elderfield has advised the Commission of the Central Bank that he has waived his €100,000 bonus entitlement at the end of his contract of employment.” And indeed there has been a running theme on here about Matthew and his €340,000 salary being 40% higher than his boss’s Governor Honohan who is now down to €230,000. There will hopefully be some insider information on here later today regarding the resignation. We can only pray that Matthew’s replacement is not some career servant of the ilk that contributed to the banking collapse in 2008. UPDATE: 9th April, 2013. Crikey, there does seem to be some worry that Matthew’s resignation betokens some instability or unrevealed bad news in the Irish banking system. Minister for Finance Michael Noonan has issued a statement to pour further oil on what could become troubled waters and he says Matthew ” is leaving at a time when normality is returning to the financial system and the Central Bank is suitably prepared to deal with his departure in six months time” So, nothing to see here, and especially no instability or anything that might give you cause to worry about any aspect of the Irish banking sector. When the NAMA CEO Brendan McDonagh spoke at an accountant’s gathering in London on 22nd March 2013, he indicated that Minister for Finance Michael Noonan would, the following week, announce the top-level financial results for the Agency for 2012. Alas, that didn’t happen but we do know that NAMA is required to have submitted its management accounts to Minister Noonan by 31st March 2013, so the unaudited results for NAMA for 2012 should now be available in the Department of Finance, and they will hopefully be made public shortly. Remember that NAMA will produce two sets of results for 2012, the unaudited management accounts imminently and then in July 2013 we should get the glossy annual report which will include fully audited results, in theory there shouldn’t be much difference between the two, but in practice, experience of the last two years shows us the auditors tend to be far more pessimistic/prudent on the impairment provision. We have the NAMA management accounts for Q1,Q2 and Q3 2012 and NAMA now calculates its impairment provision twice a year so we have an impairment estimate for Q1 and Q2 2012. A profit before impairment of €141m was generated in Q3,2012. NAMA has reported profits after impairment of €222m for H1,2012 – the impairment charge for H1,2012 was €128m. So can we predict what the overall results for NAMA will be for the year? It’s difficult but we can have a stab at estimating it. We do know that NAMA says it is generating an almost-incredible €1.2bn a year in rent of which €0.1bn comes from Irish residential property and the rest is global rent, mostly on commercial property. We also know that NAMA pays just over 1% on its NAMA bonds – in theory the interest rate should be the main ECB interest rate, currently 0.75%, but in practice NAMA hedges the interest rate or buys insurance against increases and that insurance pushes the cost up, and it is believed to be just over 1%. So NAMA pays about 1% of €27bn of senior bonds in interest. NAMA also has operating costs of about €0.2bn including payments to receivers and legal fees which are capitalised. So, NAMA should be generating over €700m in operating profit. The purists among you will point out that NAMA’s income is the interest on its loans, not the rent received, but given that 85% of its loans are impaired, you probably won’t be a million miles out by substituting rent for interest income. NAMA does produce an “effective interest rate” calculation but this is based on NAMA’s predictions of future income. But what about the impairment? If the value of the underlying security for a loan which is mostly property in Ireland has deteriorated over the past year, then given that most loans are non-performing then NAMA should be looking at another large impairment charge. Jones Lang LaSalle says commercial property declined by 8.0% in 2012 and the CSO says that residential property declined by 4.5%. Development land is probably at the bottom having fallen 90-98% from peak. However, NAMA is not required to write down the value of its loans to the value of the underlying property. No, current accounting standards allow NAMA to make all sorts of flaky assumptions about the value of the loan, and the value of the underlying is only part of the consideration. Still, I would expect NAMA to take an impairment charge of at least €500m in 2012 and the €128m reported by NAMA for H1,2012 looks low. It remains to be seen if NAMA will be brazen enough to claim another €0.2bn tax credit in 2012, but if it did, that would flatter the profit after tax figure. There is a lot of jiggery pokery that goes on at NAMA in recognizing and not recognizing profits on disposals, with NAMA only recognizing profits when the entire loans of a debtor are 100% resolved. At the end of 2011, NAMA had accumulated losses of about €1bn, a loss of €1.1bn in 2010 and a profit of €0.2bn in 2011 (though almost all of the 2011 profit was a tax credit). So, overall for 2012, we should expect NAMA to report a profit, probably €400-500m before tax though remember the unaudited accounts have traditionally shown a lower impairment than the audited accounts included in the glossy annual report . NAMA is likely to be sitting on a cash mountain though the direction from Minister Noonan to make €1bn available for the IBRC liquidation will make a dent in that, but that is post year end. NAMA will face scrutiny over its claims of generating €1.2bn in rent. It will also be challenged about the quality of its remaining assets with NAMA recently getting tetchy about claims that it has been disposing the “low hanging fruit” or quality assets in the UK for which there is a market. The pre-pack receivership of the media group which publishes the Irish Examiner continues to reverberate. Yesterday in the High Court, the landlord of the Cork premises which houses the 550 staff of the Irish Examiner and sister papers, sought to repudiate the lease on the building and kick the staff out of the Lapps Quay premises in Cork city centre. RTE reports “Kilquane [the landlord] has “absolutely no interest” in dealing with IEL given its behaviour to date and “cynical” attitude concerning contractual and leasehold obligations”. Indeed some of Thomas Crosbie Holdings’ other creditors are peeved as well and there is a humdinger scheduled for the High Court from October 2013 when Donagh O’Doherty’s Webprint Limited , the company which had a lucrative contract to print the Examiner and other papers in the TCH stable, will press its case for substantial damages following the repudation of its printing contract in the pre-pack receivership. So Kilquane Limited, the landlord, is unhappy. But Kilquane Limited is a company owned by Howard Holdings, a major NAMA borrower whose principal Greg Coughlan has fled the country. So, moral umbrage at the pre-pack receivership seems misplaced in this instance. Yesterday in the High Court, the redoubtable Judge Kelly ordered the dispute to be heard on 8th May 2013 at the Commercial Court.